Q: Do I need a license to sail a boat or drive a boat on the water in any location? A: The answer is No. Nowhere in the US is it required to have any certification or training to own or sail or operate a boat. Anybody can jump on a boat, even a child, and attempt to sail it without any organization overseeing them. Q: So why is there any certification offered? A: To extra assure the boat charter company from inexperienced boaters. There are plenty of people who have never been to a school and took some sailing at Summer camp or learned on a friend’s or family member’s boat or their own boat, and they are fine sailors that are allowed to operate a boat for pleasure sailing, as long as it’s not a business. Q: Wow, so these schools that make it like you must have Certification are totally intimidating the student, making them think it’s required like a pilot’s license or something? Q: Should I join a club, or should I sail on friends’ boats instead? A: If you join a club, you are stuck with high monthly charges and personalities of people that you are thrown together with and you may not enjoy their company. Q: Does it matter if I learn on a sailboat with no engine, or choose to go with a sailing yacht that has an engine for backup power? A: In case the wind stops or if you encounter a storm, learning on a sailboat with an engine is a must because it’s the only thing that will get you to safety. Many schools use small sailboats with no engine to save money, and you the student may suffer as a result. We only use sailing yachts with an engine because we care about your experience. Q: Why do so many schools put everybody through a course that only covers a set limited curriculum, when different students learn at different speeds and have different learning abilities? A: Because they make more money by putting everybody at the same speed regardless of if you’re an A student or you have learning disabilities. With us, if you’re a fast learner, you can gain the equivalent of a couple or a few courses in our 12 hours of learning because we adapt the information to you personally. Do you want to learn to Sail? Join the exclusive world of experienced yacht sailors with our affordable lessons. Southern Sailing in Jacksonville, Florida, offers sailing instruction and Sunset cruises. · Our prices for 12 hr. certification course for bareboat charter $29 per hr p.p. (double occupancy) = $348 per person. We certify you for handling up to a 35 foot boat for bareboat charter. Single person rate $39 per hour=$468 for 12 hours of personal instruction. 10% discount for Gift Certificates purchased from us. · We have successfully taught over 15,000 students to sail since 1980 at our Marina del Rey Ca., Houston Tx., Atlanta Ga. academies. · We offer 1 on 1 instruction tailored to student’s individual learning curve. · No classroom – watch 2 hr. instructional DVD before coming to yacht. All time spent on the water hands on. An excellent introduction to sailing or refresher to regain your sailing confidence. This 2 hour on the water workshop teaches Basic Sailing Terminology, Parts and Functions, Helm commands, Sail trim, seamanship and safety while sailing. Each workshop is during the afternoon, beginning at 1 pm. ​Customize your workshop or workshops fit your schedule and level of experience. We will happily assist in scheduling your workshop. The Discover Sailing Workshop for the Spring Special discount is $89.99, whether it is one student, or with the upper limit of 2 students per class. Beat the heat and enjoy the sunset. We are offering evening lessons for 4, 3-hour sessions from 6 to 9 p.m. These lessons are offered on weeknights. You may also attend from 4 to 9 p.m. on weekends if you prefer. Our courses are designed to prepare the student to successfully challenge the certification standards for that particular skill level. Most of our students are able to pass the Southern Sailing Charter Certification practical skill requirements during course time. Some however, require an additional review course or two before they are ready to challenge the practical checkout. On average, our students are ready to charter after 4 days of formal instruction. Even with sailing certification, many charter companies may require an on-the-water test of sailing skill practical checkout before chartering. 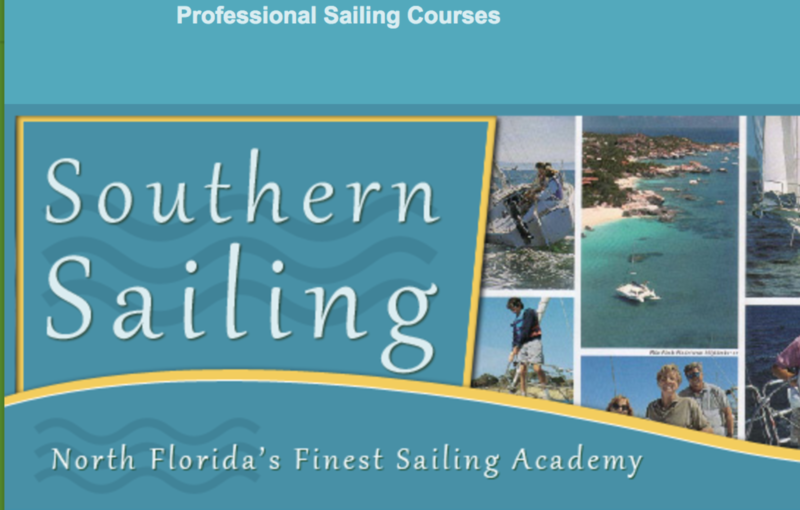 Southern Sailing Charter Certification is available to others who successfully challenge the practical checkout. If a student cancels the lesson due to personal or travel delay, or if we deem that sailing conditions are adverse or unsafe, we will issue a rain check valid at any time. No refunds are issued, since we would have reserved the vessel and instructor for the proposed course. This course teaches a beginner how to safely and efficiently sail boats about 25 feet long, in light to moderate wind and sea conditions. The theory of sailing, points of sail, nomenclature, rigging, docking, rules of the road, safety at sea, and response of the boat to the movement of the helm are covered, along with sail trim, knots, buoys, international code flags, true and apparent wind, wind shifts and telltales.